The date of 1899 makes it clear that Trego found time to do something besides The Rescue of the Colors in that eventful year. The subject of this portrait is unknown. 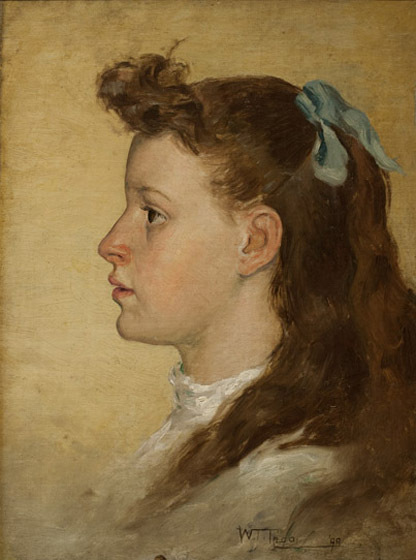 She does not seem to have been a member of the Dowlin family, whose portraits he had begun painting in the late 1890s. Also unknown is whether or not he ever did a final version of this work. While the study is very detailed, it is most likely only a means to an end. Owned at one time by Walter Baum, the portrait was purchased at an auction by George Moll, grandfather of the current owner, who inherited the painting. The painting was removed from its stretchers, and mounted on a board, most likely by Bert Baum, who frequently took this approach with the Trego paintings in his late father’s collection. Some of the tack marks can still be seen around the edges, and it is likely that Bert Baum also did some in-painting around the edges outside of the original surface. A note on the back indicates it was varnished in 1944. In 2010, the painting was cleaned and conserved, and now is in excellent condition.